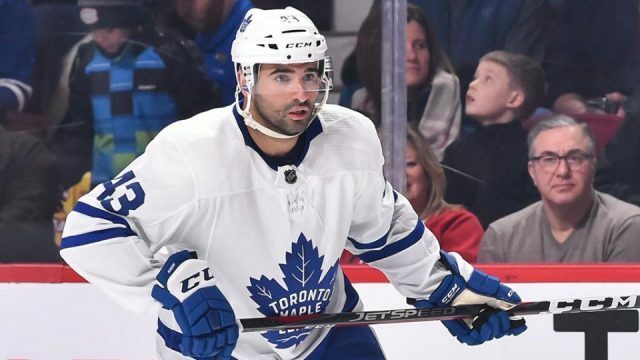 You might have seen that Nazem Kadri cross-check Saturday night. If you have not yet seen it, here is the incident in its entirety, from Boston Bruins forward Jake DeBrusk hitting Toronto Maple Leafs’ forward Patrick Marleau into the curved section of the glass to Toronto centerman Kadri being escorted out by referee Brad Meier. If you know anything about Kadri’s disciplinary history, you might have expected something like that to happen as Game 2 progressed. Kadri served two minor penalties in the game before receiving a five-minute major and game misconduct for cross-checking DeBrusk in the head, including matching roughing penalties with DeBrusk halfway through the first period. Kadri did also score the only Maple Leafs goal the entire game, minutes before he was ejected. It seems he has a bad habit of retaliation when he loses his temper in games. Almost exactly one year ago, Kadri was suspended for three games in the first round of the playoffs after executing a dangerous hit to the head to then-Bruin Tommy Wingels in nearly the exact same location on the ice. In that suspension explanation video (which I wrote about here), the NHL emphasizes that Wingels is defenseless in this situation; Kadri is acting out of retaliation and is in absolute control of his body going into the hit. This sounds eerily familiar; it is the same language used to describe Kadri’s actions on April 13, 2019, against DeBrusk. Now, Kadri is suspended for the remainder of the first round of playoffs, regardless of games. He will not see the Bruins again until the 2019-2020 season. This isn’t a suspension method one sees often, but in the postseason, and particularly following the physicality of Saturday’s game, it is a thoughtful decision. By eliminating the presence of Kadri entirely, the league eliminates the possibility of Kadri stirring more trouble with the Bruins—particularly DeBrusk, as Kadri took offense to an unintended collision with him earlier in the game—as well as the Bruins’ seeking retaliation against Kadri for his actions. While there is a place in hockey for defending teammates, even beyond the 60-minute game it happens in—and can often create storylines that make a playoff series exciting—the video explaining Kadri’s suspension this year state that this ‘Is not a hockey play’ and that retaliation has no place in the sport. Defending and protecting your fellow skater is a key part of the game of hockey, but the league might be trying to remind its players where that line turns into an illegal play. Following the physicality of some of the playoff games recently, it might be necessary. This will be Kadri’s fifth suspension in his NHL career. Kadri is 28-years-old, and has only played in seven NHL seasons.